Spring is a season near-universally loved by Canadians nationwide. Living this far from the equator, we experience some very severe winter weather! Storms, snowfall, ice, bone-chilling cold—all are par for the course during a typical Canadian winter. Of course, our reward for enduring the winter season is spring! Spring is a gorgeous time here in Canada. We emerge from our indoor caves and head out into nature once more. We look forward to breathing in fresh air, soaking up vitamin D and sniffing budding spring blossoms. And that is when it happens: spring allergies. Miserably, allergy season is not only starting earlier each year but also lasting longer. Even if you know it is coming, you may feel helpless to fight back… until now. Despite a strong urge to get back in nature when spring arrives, statistics tell us the average Canadian adult still spends up to 90 percent of their time indoors. Some of us may emerge for as little as only five minutes each day—about the time it takes to transfer groceries from trunk to fridge. What does this means for your seasonal allergy symptoms? It means you are likely inhaling the vast majority of irritants (pollen, bacterial and fungal matter) indoors! But unless you have ragweed or hay growing in your indoor planter pots, how is all that pollen getting inside your house? The truth is, you are bringing it inside with you on your clothes, shoes and even your hair. If you have pets (especially dogs who love to roll around on the grass) they are bringing it inside too, often multiple times each day. Once inside, these irritants become part of your indoor air supply, getting recirculated through your HVAC system and blown out onto you through your air registers. What About Air Filters, Don’t They Trap Pollen? This is a great question! But you may not love the answer. The truth is, only specialized types of air filters have the capacity to trap and retain airborne micro-particulate matter like pollen and mould and mildew spores. These filters, called HEPA (high efficiency particulate air) filters, were first developed during the second World War to protect laboratory scientists from radioactive micro-particles while they invented the atomic bomb. Today, HEPA filters are still the reigning choice for laboratories, hospitals and other spaces where air purity is paramount. Unfortunately, most modern residential HVAC systems cannot accommodate HEPA air filters. This is because HEPA filters are sufficiently dense that they slow down air flow and consequently place tremendous pressure on the HVAC system. However, there is another option: you can install a standalone HEPA air filtration system that will work with your existing HVAC system to trap micro-particles as small as 1/100th of a single human hair. This capacity works handily for culling pollen particles out of your indoor air supply! Are There Any Other Options to Remove Pollen from My Indoor Air? We’re glad you asked! There is another option that is becoming popular throughout Canada for its air-purifying powers. This appliance is called an ultraviolet air purification system. Unlike HEPA, which uses a dense filter to trap particulate matter to keep it from recirculating throughout your home, a UV air purifier changes the structure of airborne toxins so they cannot do their work. In a way, you could say the UV air purifier “zaps” toxins right out of the air before they ever get into your air ducts. For a moment, visualize your living room as it is now. Next, imagine it ten years from now—but you haven’t dusted, vacuumed or cleaned it even once. Things would probably be pretty dusty and dirty in there, right? The same principle holds true for your indoor air duct system. This is especially the case when you have an older home with a traditional HVAC system using the standard-issue furnace filters, which are really designed only to keep larger particles from interfering with the motor and internal components. Also, as air ducts begin to sag, rip or leak over time, insects, small animals, and mould and mildew spores can find their way inside to set up shop. It’s quite amazing what we have found inside customers’ air ducts—everything from DVDs to socks to rodent nests to food wrappers. But the majority of debris inside your air ducts is likely to be pollen, pet dander, dust mites, plenty of dust (which explains the dust mites), volatile organic gaseous compounds, mould and mildew, and bacteria. This is why we recommend having your indoor air ducts professionally cleaned and sanitized before installing any kind of ongoing air filtration or purification maintenance system. Not only will you extend the useful life of the system you choose by not taxing it so hard right from the start, but you will feel the impact of breathing in pure, clean air right away rather than having to wait. Why Do Indoor Air Duct Cleaning in Spring? Winter can bring interesting visitors to your air duct system as they seek places to stay warm. Once inside, they introduce new toxins that can then trigger allergic reactions in you. 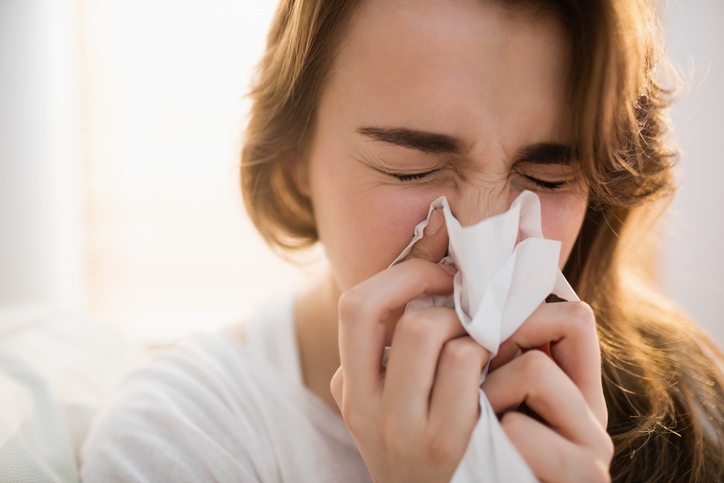 But the biggest reason we recommend spring for air duct cleaning is that it the best way to help your immune system fight off seasonal allergies and asthma attacks. When you clean up your indoor air, you clean up your respiratory system, your lungs and your health! Right now, boost your spring indoor air quality by saving 10 percent on all three of our popular indoor air duct cleaning packages!